The Black Nomad is an ideal all round lure for rainbows and browns on still waters of all sizes. It is a great search pattern,that often works best late in the season. This fly has the bead tied further back so that the fly will sink at an even rate to give is a better chance of hooking on the drop. A small lure with a big reputation and all thanks to unsung fly tying hero, Rob Spiller. Charles Jardine (Fly Fishing & Fly Tying) July 2001. Head : Fluorescent Green Glo Brite Floss, cone shape build up. Epoxy to finish. 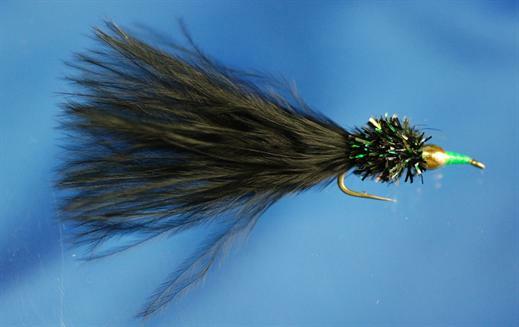 Tail : Black marabou, 1 to 2 inches beyond the hook bend. Currently there are no comments about the Black Nomad fly pattern from other fly fishermen yet.